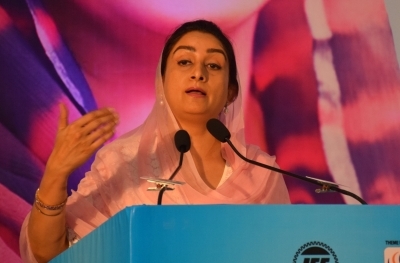 Kolkata July 13 (IANS) Union Food Processing Industries Minister Harsimrat Kaur Badal on Friday said the request for proposal (RFP) for the non-banking financial company (NBFC) exclusively catering to the financial needs of the food processing sector would be floated this month and the NBFC would possibly be operational by the end of this year. According to her investment worth close to Rs 2 000 crore would possibly be pumped in for the setting up of the NBFC which is likely to be named Agro-Processing Financial Institution. "The RFP is supposed to be floated this month and I had a meeting with the Finance Ministry yesterday (Thursday) for some clarification on expenditure. There is a lot of interest from the private sector not only nationally but also globally (to invest in the entity). We are looking at an investment of Rs 2 000 crore. We are putting seed money of about 20 per cent " she said. There is a huge growth potential in the sector. However access to bank funds has been difficult because the banks fail to understand the risk assessment for the sector she said on the sidelines of an interactive session on food processing industry organised by the Indian Chamber of Commerce here. "The growth potential is huge but banks have refused to finance the way we would have wanted them to as they do not fully understand the risk assessment " she said. According to her there have been hardly any proposals from the food processing industry in West Bengal under the several Central government schemes. "Many proposals from the states of Maharashtra Gujarat Andhra Pradesh Karnataka and others are coming in but I do not recollect any from Bengal " she added.